Belhaven owned pub. Low ceilings, ancient wooden fittings and a warren of cosy corners, with additional drinking in the beer garden at the rear and on the street during the summer months. Lively, modern bar/cafe with over 50 types of burger, plus locally sourced coffee, a great range of cocktails, live music nights and a weekly pub quiz. Dogs are welcome any time of the day. 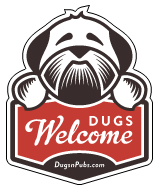 There are a total of 20 dog friendly listings in the Dundee Pubs category. Please log in, or sign up as a member to view all listings.